The Tree Care Industry Association (TCIA) urges homeowners in areas affected by Winter Storm Jonas to consult the enclosed tip sheet to ensure safety during post-storm cleanup. "For safe and efficient post-storm work, hire an arborist with the experience, expertise and equipment to safely take down or prune damaged trees or limbs." Winter Storm Jonas buried the eastern United States in snow, and thousands of homeowners were faced with power outages, disrupted travel, and damaged landscapes in the storm’s aftermath. Many of these outages are attributed to falling trees, which buckled under enormous ice and snow loads and high winds. Contact with energized power lines can result in electrocution. For this reason, it is best to always assume a downed utility line is energized. Take care to avoid interacting with objects near the damaged lines, as this can result in indirect electrocution. Even tree branches are known conductors, so check the brush and foliage carefully for hidden downed lines before clearing the area. When applicable, call your local utility immediately to report the hazardous line. While most homeowners can clean up scattered branches and other tree debris with no issue, they should never consider removing a large tree or branch unassisted. Homeowners should contact a tree care professional for help in most situations, particularly if the tree work requires climbing, advanced tree removal techniques such as directional felling, or if the tree appears bent under tension or is otherwise unstable. Trees near utility lines, buildings, vehicles, shrubs and other objects should also be handled by a professional to avoid further damage. For safe and efficient post-storm work, hire an arborist with the experience, expertise and equipment to safely take down or prune damaged trees or limbs. Be wary of tree care scammers. Don't just hire someone with a chain saw who knocks on the door. With hundreds and possibly thousands of dollars at stake, not to mention the integrity and appearance of one’s property and personal safety, it imperative to vet potential contractors before hiring. To report a tree care scam, call the FBI and National Center for Disaster Fraud's (NCDF) hotline at (866) 720-5721. Ask for current certificates of liability and workers’ compensation insurance. If the tree care company doesn’t have insurance or is not a legal company, the homeowner could be held responsible for accidents on the property. Ask for local references, and check on the quality of their work and level of service. Verify professional affiliations the company might have, such as memberships in business and/or professional organizations, or Accreditation with the Tree Care Industry Association. Insist on a signed contract as to cost, dates when work is to be performed, and exactly what is to be done. Get a second opinion and quote. An easy way to find a reputable and professional tree care company in your area is to use the "Locate Your Local TCIA Member Companies" program. Use this service by calling 1-800-733-2622 or by doing a ZIP Code search on http://www.treecaretips.org. 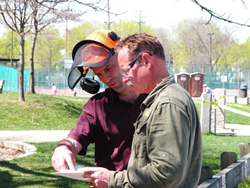 Founded in 1938, TCIA is a public and professional resource on trees and arboriculture. It has more than 1,900 member tree care companies who recognize stringent safety and performance standards and who are required to carry liability insurance. TCIA has the nation's only Accreditation program that helps consumers find tree care companies that have been inspected and accredited based on: adherence to industry standards for quality and safety; maintenance of trained, professional staff; and dedication to ethics and quality in business practices. TCIA also has the industry's first safety certification program, Certified Treecare Safety Professional (CTSP), which credentials individual arborists for safety practices and knowledge. Editors: If you would like additional information, storm-related articles or digital photos, please contact 1-800-733-2622 or marketing(at)tcia(dot)org. TCIA arborists, safety and business professionals are also available as sources for tree related articles and issues: Contact 1-800-733-2622 or tandersen(at)tcia(dot)org.